Once a set of box braids has been installed, there are numerous ways to style them. Since the braids are very versatile, they allow the wearer of the braids to be creative when styling them. Note: These styles assume that your hair already has box braids. 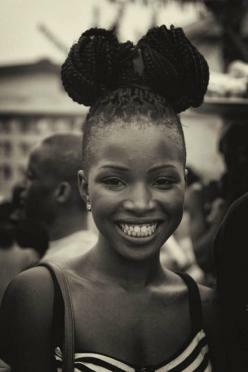 A classic high bun is a great option for box braids. This style great for the office and casual enough to wear every day. For this style you will need: a large ouchless headband, small elastic bands, and bobby pins. Position the hair into a high ponytail using the large ouchless headband to secure the box braids. Split the ponytail into two pieces. Two strand twist one side of ponytail first, and secure with an elastic band. Two strand the other side of the ponytail, and secure with an elastic band. Take one of the two strand twists and wrap the twist the base of the ponytail and secure with bobby pins. To hide any loose ends sticking out from the bun, tuck them in underneath the bun and secure them with bobby pins. Put an exciting twist on the causal half- up, half-down style by adding a bun to the front of the head. For this style you will need: a large ouchless headband, and bobby pins. Separate the hair into 2 sections-a front section and a back section. For the front section, put the hair into an off-centered high ponytail. Begin to twist the ponytail into one two strand twist and secure with an elastic band. Wrap the hair around the base of the ponytail creating a bun and secure with bobby pins. Leave the back section of the hair down. Adding a side braid to box braids is a cute way to keep the hair out of the face without having to tie all the hair back. For this style you will only need bobby pins. Decide which side you would like for the side twist to be on. Begin to move the braids to the chosen side. Starting at the top of the side part, begin to twist the hair away from the face. Slowly add more braids to the twist as you move down. Once you have decided where you would like your twist to stop, secure it with bobby pins. Making a bow out of box braids is a unique way to style the hair, and to keep long box braids neat and out of the way. For this style you will need: a large ouchless headband, and bobby pins. Position the hair into a high ponytail and use the large ouchless headband to secure your braids. Pull the hair through the band again, this time stopping halfway through so the ends are sticking out of the bun. Separate the bun in to two pieces; as you do this it will start to resemble the ends of a bow. Take the leftover ends of the ponytail, and push them backwards. Position the ends in the middle of the bow and secure with bobby pins. Take the rest of the hair ends and tuck them underneath the sides of the bun. Spread out both ends of the bow. Be careful when styling a new set of braids, especially if they feel tight around the hairline. Attempting to style braids that are too tight can lead to both hair loss and hair breakage because there is more stress added to the hairline. A major sign your braids are too tight is when tiny blisters around the hairline are visible. Before styling, try waiting for braids to loosen up naturally, or loosen them yourself. Be sure to remove all elastic bands and bobby pins from the hair before sleeping, to give the hairline a rest.